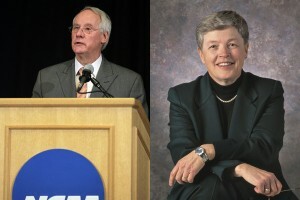 In response to two records requests, the current and previous heads of the NCAA’s executive committee say they won’t release documents that show what they did while leading the group over the past two years. Staffers at Michigan State University said none of the documents sent to President Lou Anna Simon from the NCAA detail public business. However, they decided to release 166 pages of correspondence of their choosing. After providing 166 pages (99 were the publicly accessible Paterno et. al. lawsuit), they charged $149 for their goodwill. At Oregon State University, staffers said that they conducted a “thorough review,” but found only two “public records” that were responsive to my request. They didn’t say they withheld any records, but if the NCAA sent Simon more than 150 pages over the course of a year, it’s hard to believe that her predecessor received only two records from the same group over the course of more than a year. I’m familiar with the positions that both universities have taken. Pennsylvania officials made similar arguments about records sent to the five state employees who sit on Penn State’s Board of Trustees. In July, the Commonwealth Court nixed that idea, and information is flowing again. I gave OSU until today to explain how their “thorough review” only found two records from the NCAA. Under Oregon law, you can appeal any denial of access to public records to the state attorney general’s office. But in Michigan, my only real option is to file suit in East Lansing circuit court within four months. I can also appeal to Simon herself, but it’s probably not the best use of my time. I haven’t decided whether I’ll take the dispute to the courts. NCAA the best crooks in town and yet they just keep lining their pockets … Time for people to demand the real truth from these thugs or better yet people can put them under… Time to really show how croaked sport filed really is….